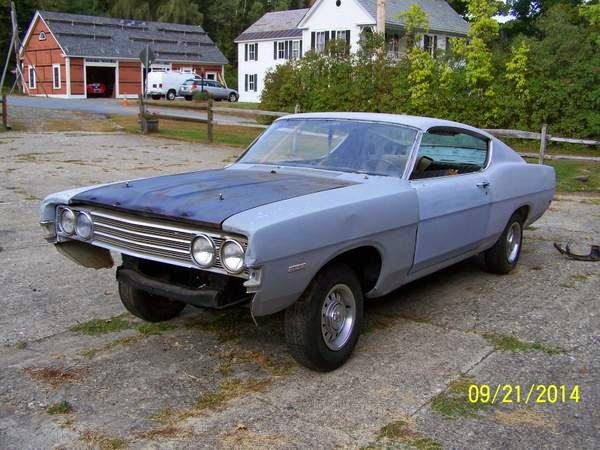 One of my favorite pastimes is checking out the junk in the background of craigslist listings. Most of the time you can find piles of old metal, sometimes using Kaibeezy's photoshop tips to enhance the images. The other day, a few tips for some '70 Mustang Fastback Mach 1s came in from BigEgyptian, I immediately became obsessed with the additional cars in the background, which were also for sale. Let's go through this treasure trove of FordMoCo classics one at a time. All tips from BigEgyptian, all cars located in Southern Vermont. 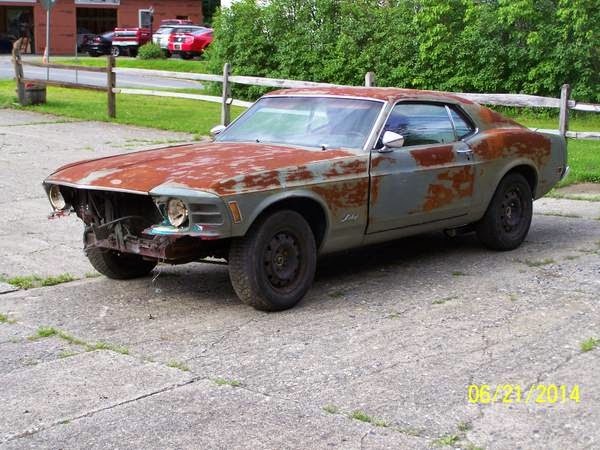 First up is this 1970 Ford Mustang Mach 1 offered for $20,000 in Southern Vermont via craigslist. The car was originally built with a 351W M-code with a 4-speed manual, but now is powered by a 429 cubic inch CobraJet V8 mated to an automatic transmission. Underhood shows a bunch of gaudy dress up parts and a giant crane cams sticker, but the bottom also shows some surface rust -- not sure if this is an amateur restoration or an older custom, but it will need some work before it is perfect. Next on the lot from the Lord of Ford Hoards is this 1970 Mustang Mach 1 offered for $14,000 from the same seller via craigslist. It is in miserable condition and riddled with rust holes, but it comes with an M-Code 351W V8 and a 4-speed manual gearbox, hence the high asking price. The next Fastback is closer to being re-absorbed into mother earth, it is a 1970 Mustang Fastback offered for $3,900 from the same seller. It is an M-code 351W V8 powered car with a 3-speed manual and 9-inch rear end. The Marti report shows an original interior described as Vermillion Rhino/Corinthian Vinyl bucket seats...which is an indescribably awesome sounding name. Moving on from the Mustangs, the seller also has this 1969 Ford Torino Cobra offered for $5,500. It was originally a 428 cubic inch monster with a 4 speed gearbox, but it can now be best described as a soap box racer, because the engine/trans is long gone. Frankly, this car looks like the most desirable of the collection because of the Cobra name and it would be an awesome car powered with a modern Cammer 5.0 swap or EcoBoost 3.5 V6. 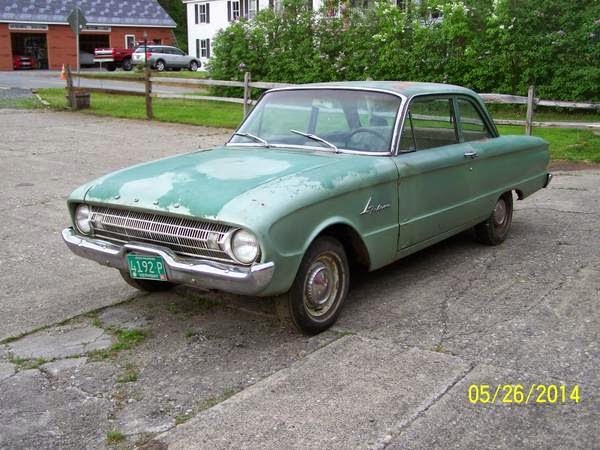 Last from this Southern Vermont collector of Detroit iron is this 1961 Ford Falcon offered for $3,000. The little coupe is powered by an old inline-6 and the seller describes it as a potential hot rod project. One has to wonder what it would take to pickup the entire collection...? 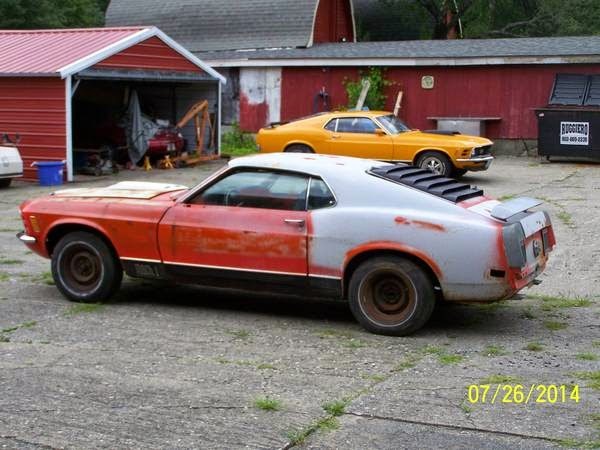 That Mach 1 is tough. I'd put my prom dates garter belt on that rearview mirror any day. Sean- you just put my coffee through the old nasal filter! I'd forgotten the fair trade fare guide of the '70s. That 61 Falcon reminds of a time in early 70's i could have picked up one that was very straight and ran for $25.00 bucks those were the days.